Everything is assembled and the first cut is made...it looks like everything is dialed in. Elaire or Precise Bits Collet for my DeWalt 611? Second cut did not work out quite as well...I did a shallow V-Cut, but about half-way through the machine seemed to half shifted about 1/8th of an inch on the Y-Axis. I stopped the program when it happened...any suggestions? Could it have shifted because of the feedrate? I was running the feedrate at F100 (G20 - inches)? 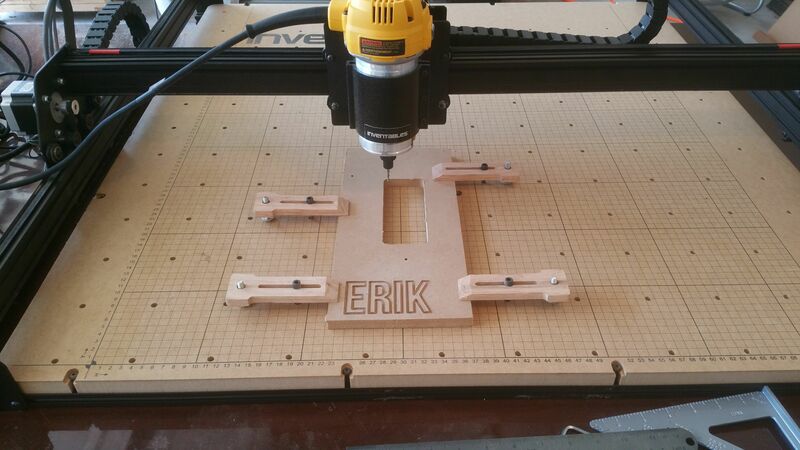 1/4" 60 degree v-bit in the Dewalt DWP611 cutting 1/2" MDF but the total depth of cut for the deepest parts was 1/8". @sketch42 Thanks, I'll give it a shot today. Bumped up the Y-Axis pot a little and tried another v-carve...much smaller this time, a little butterfly. 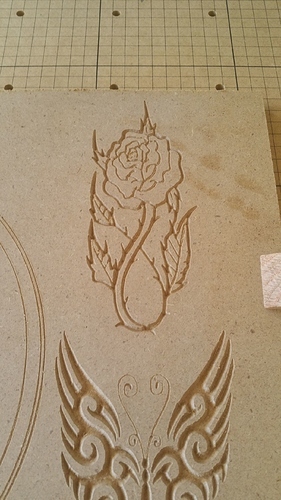 Let's see that first carve you tried out finally finished, looks very nice! Recut just the center of the big one from yesterday. F100 G20 (inches), 1/4" V-bit with 60 degree cutters. Came out nice, would look better in wood. Might do the whole thing for a lazysusan in walnut. 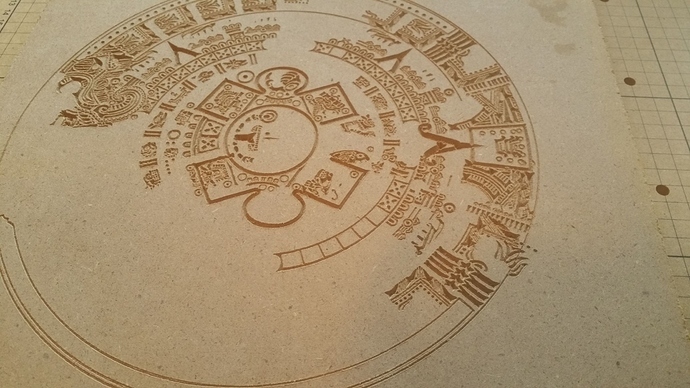 I will try with a 1/8" V-bit, 60 degree to see if the detail looks better. 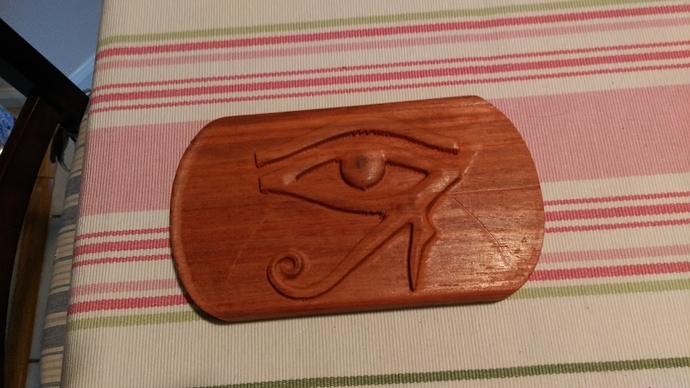 A quick relief, the Eye of Horus in 3/4" African Padauk (5 inches in width). I used a 1/8th inch ballnose bit with a feedrate of 50ipm and plunge of 30ipm. Still testing things out. 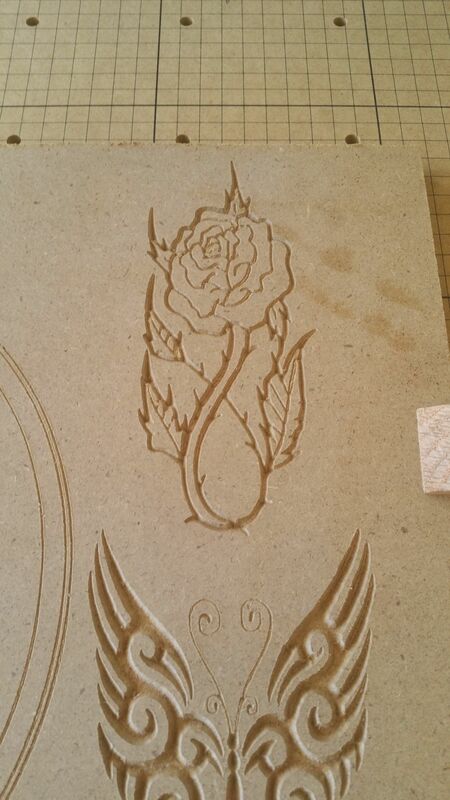 I did this in 1 pass cutting up to 1/4" at a time. A second pass with a 1/16th inch ballnose might clean it up a bit, but a little sandpaper will do wonders. What is that design you are using? I like it. 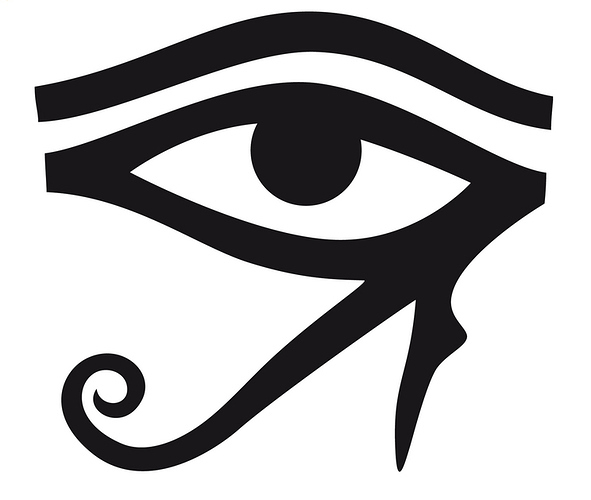 It was an "Eye of Horus" black and white image I grabbed off of google...put a cartouche like shape around it. Generated the toolpaths and sent to the machine with UGS. 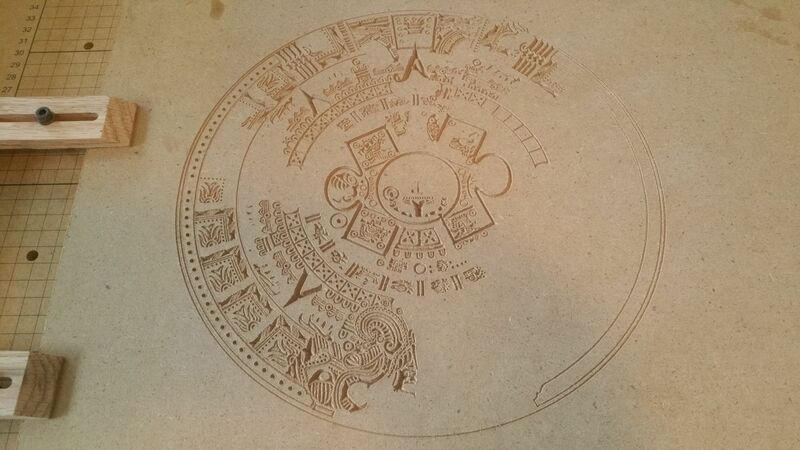 The eye is well done, but what is the big circular design? That one is an Aztec Sunstone. I liked your Aztec design so much I tried to make one myself. 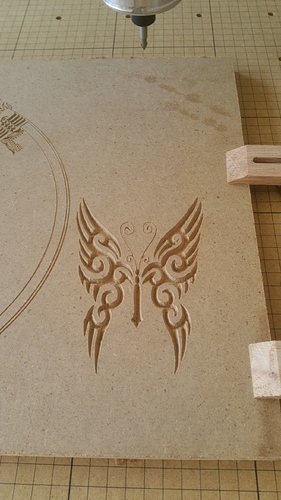 I found a line drawing and imported it into Vcarve, vectorized it and then created a toolpath for a 60 deg vbit. Here is a time lapse of my attempt. Is there some kind of curse on making one of these? When I get back home tonight I am going to try to edit the code to remove all the lines that have already been carved and see if I can start it back up where it left off. What could possibly go wrong with that plan? 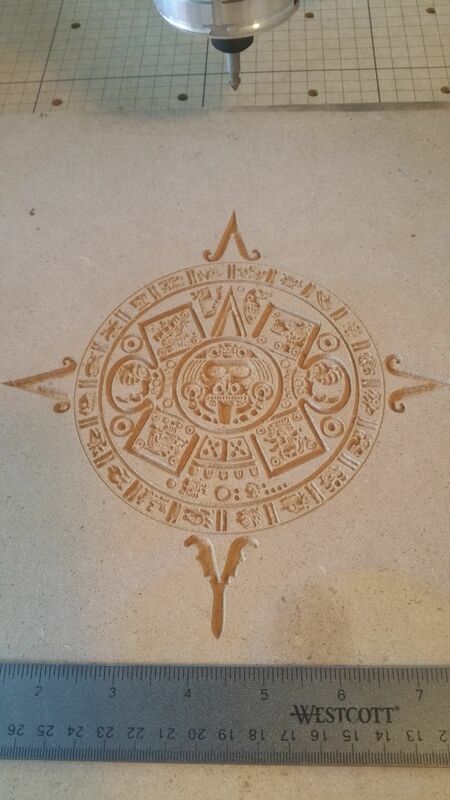 The curse of the Aztec Sun Stone...good luck with trimming the code and finishing it off...I usually just start over when I get an error like that. I had UGS stop on me on a couple different ones now, so I am playing with ChiliPeppr now to see if I have better luck. How many lines of G-Code did you end up with, mine was 89k and change...I had a DFX file of the image I got from CNCZone.com and used that. If you like, I can send it to you when I get home from work or I can find the link and send that. I think it was in the zip file about 3 posts down in the thread. The file was about 230k lines of gcode, it carved the first 160k lines before it stopped. So,,, only another 70K to go. I have edited the file and I feel confident this is going to work great!